Welcome to our website - we hope you find it useful and you can contact us if you would like more information about anything you've seen on this site. Rockley is a small hill farm in the Exmoor National Park owned and run by Nic Barker and Andy Willis. We have ridden, hunted and competed our own horses barefoot for many years and we specialise in rehabilitation livery for horse with hoof-related lameness. 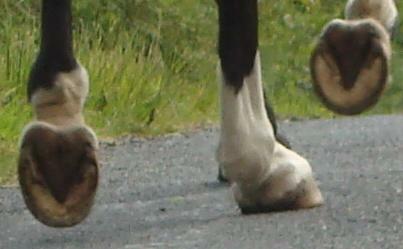 Our objective is to improve soundness by allowing each horse to grow the healthiest possible hooves. We use conformable surfaces to keep horses comfortable when they first come out of shoes. Controlled and careful exercise (in hand and ridden) then helps build stronger and better balanced hooves. You can find out more about rehabilitation and the sorts of conditions which it can help on the FAQs and rehabilitation pages of this site. Our blog also contains news, updates on rehab horses, lots of information about hoofcare and all our photos and videos.